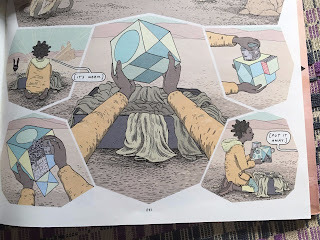 Anders Nilsen’s bibliography is a protean one. Beyond his opus Big Questions, a serialized graphic novel about a flock of birds, a snake, and a crashed pilot, it’s difficult to encapsulate what sort of writer Nilsen really is. 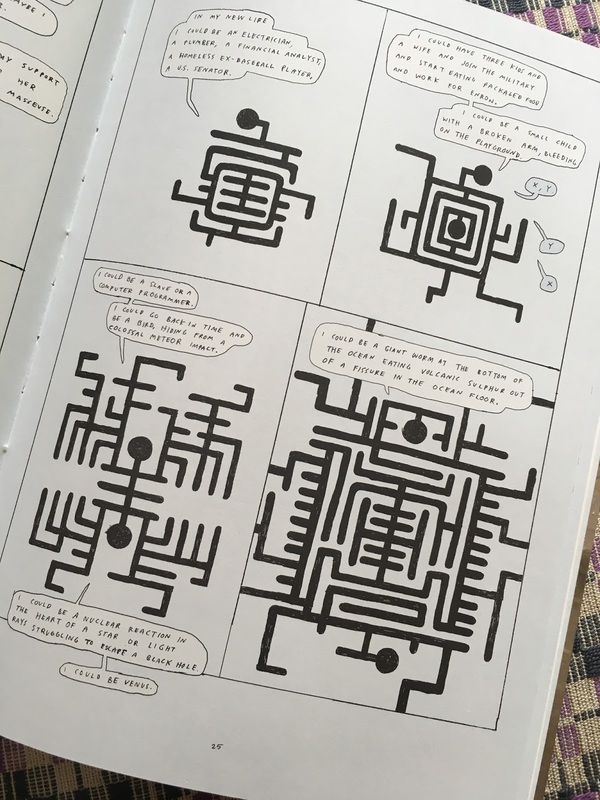 He’s published seven other books with Drawn & Quarterly and Fantagraphics, and not one returns to the same storytelling approach that made Big Questions such an engaging and mysterious tome. Works like Dogs and Water, Rage of Poseidon, and The End are all contemplative and beautiful little pieces, but they feel, at times, like side projects -- experiments in both technique and philosophy. Without the pressure of an overarching, multi-year plot, Nilsen tries new ideas and forms with each new page. Poetry Is Useless, a collection of the artist’s sketchbooks published by Drawn and Quarterly in 2016, feels like a microcosmic example of Nilsen’s expansive style: from gags to portraits to surreal landscapes, the collection quietly reinforces the artist’s penchant for exploration. These are engaging works, no doubt, but confounding in their meander: after Big Questions concluded in 2010, one could bundle together Nilsen’s prolific output and consider them signs of an artist looking for what’s next. An artist growing outward, and expanding in turn. 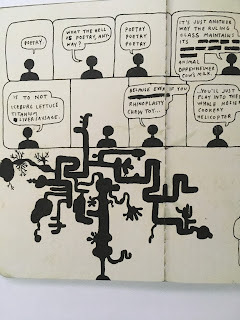 There’s a figure that appears in a number of Nilsen’s works and sketchbooks that seems to be the embodiment (or disembodiment might be more apt) of this feeling. 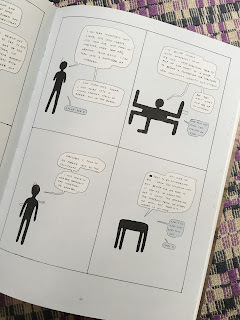 He begins as a stick figure, and in the following frames blooms into fractalling tendrils, growing incomprehensibly into every possible iteration of legs and arms. This figure expands, inward and outward, self-evolving into a dizzying conceptual tangle. It’s everything at once: influencer and influenced, purposeful and aimless. By the end, the figure is unrecognizable, lost in infinite possibility, but its limbs can be traced back to one core, one heart and mind. Did the philosophy of Big Questions grow out of mythology? Scenes with Algernon and The Snake will surely make any Plato buff proud, but perhaps moving backwards is a way to evolve even further. In an enfolded, inward expansion from the Platonic experiments of Big Questions, The Rage of Poseidon shows Nilsen fully embracing the Greek Myths while remaining formally adventurous: bound as an accordion book, The Rage of Poseidon’s single-page panels resemble a classical Shadow Play -- striking, but doubly so considering Nilsen’s previous reliance on white space in sparser works like Big Questions and Dogs and Water. But what about the artist’s unfiltered, raw works? The Monologues books show that comics as a form can be used when a creator has something to say but not necessarily something to show. Dogs and Water, although beautifully illustrated with the same precision as Big Questions, is more resonant on a theoretical level as opposed to a visual one: with little more than a deserted horizon, it’s better to swim amongst its words and ideas. As a fan, I’ve been wondering for years where all this has been headed -- wondering at what shape this twisting form might finally rest. 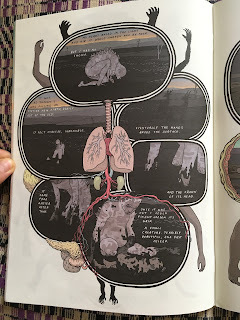 And now, I have an answer: Anders Nilsen’s new book Tongues is the denouement we never saw coming. Of course it begins with a bird, but this time it’s a detailed, scowling vulture flying over a salmon-pink desert. The bird alights upon a cluster of three military vehicles: one is upside-down, one on its side, as if the convoy had hit a hidden mine. A man of vaguely middle-eastern origin lies dead in a tangle, arms and legs splayed in outward angles. 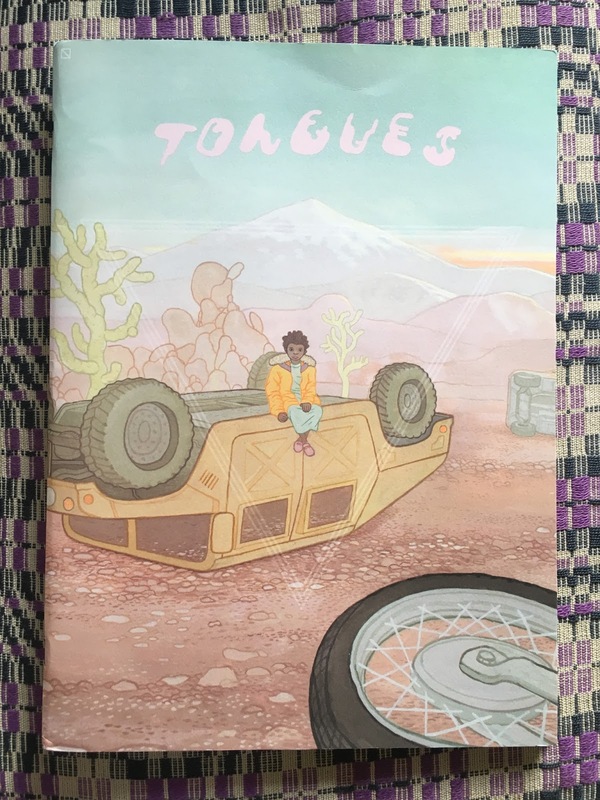 The first eight pages of Tongues are a silent, stunning echo to Big Questions’ crashed pilot and curious avian cast. 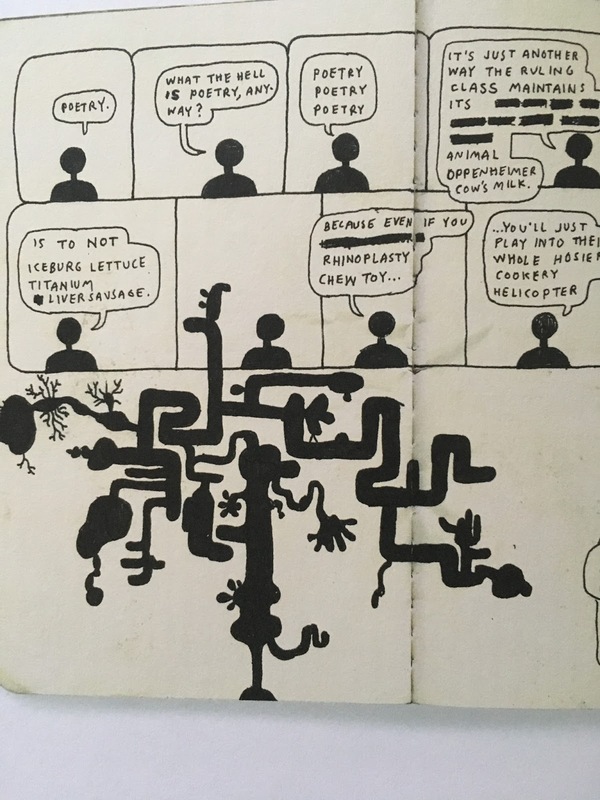 In this story, philosophical cartooning is traded for timely realism. This landscape could be any desert from our international headlines. The narrator looks older than in his story, the growths on his forehead worn down. He’s shackled to mountain clearing, and rests on an alien-like bed of green bismuth. He can still see movement in his hands, expansive growths emanating from his palms. He speaks with the vulture about his dream, and eventually says it can “do what you have to do and go.” With a single talon, the vulture neatly slices out the figure’s liver and flies away. “Let’s resume our game tomorrow,” Prometheus says. 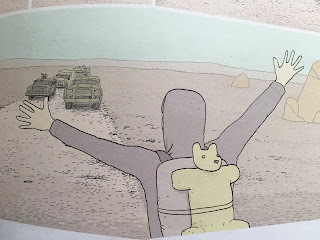 The following chapter, called “Hercules,” dizzyingly returns again to a previous Nilsen story. 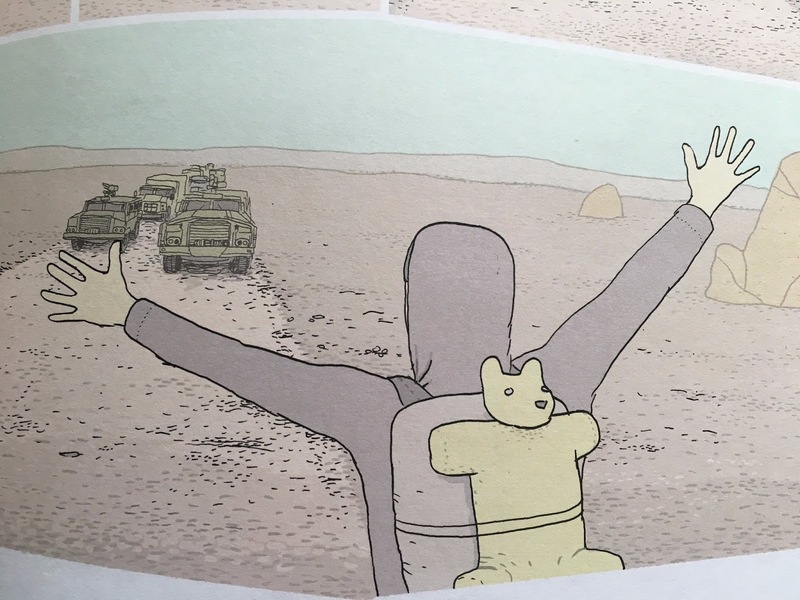 The hoodie-wearing man from Dogs & Water is back: he’s still carrying his knapsack and teddy bear, and is still walking towards the horizon, talking to himself. In Dogs & Water, he feels more like the protagonist in an existentialist experiment, but in Tongues he’s very much lost in the desert. He manages to flag down the driver of a military vehicle, who after some tense deliberation, decides to give him a lift. The chapter closes by returning to the opening wreckage. The girl from Prometheus’ dream is there, and she’s older, preteen and precocious, and perhaps the sole survivor of whatever happened before the book’s open. The appearance of a tesseract amidst the debris suggests some kind of cosmic payload was being transferred. 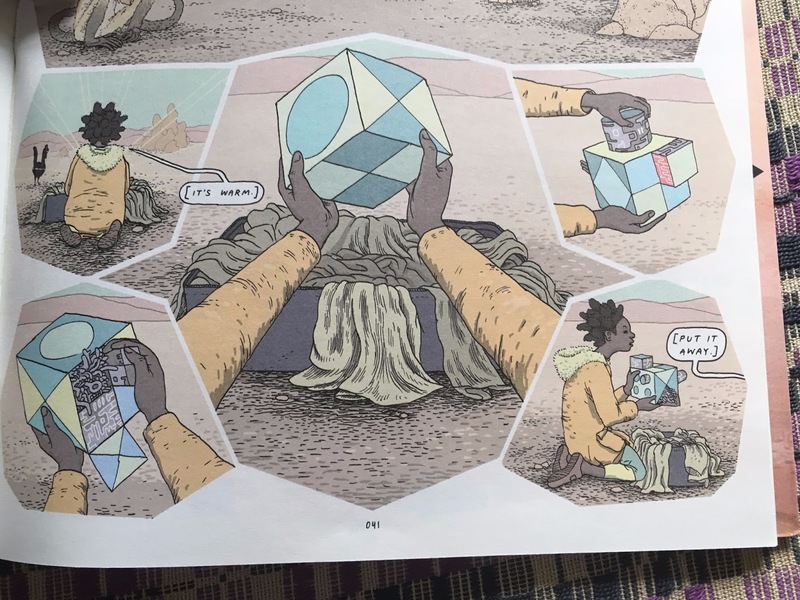 I’m almost certain I could find this tesseract in previous works, whether it’s hidden in one of Nilsen’s gardens in A Walk through Eden or buried in a sketchbook page of Poetry is Useless. 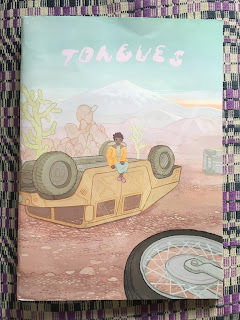 And it’s exactly this connectivity that is so exciting about Tongues: not only is it a beautifully illustrated and thoughtful read, it hums with an overarching, quiet harmony, in tune with the rest of Nilsen’s oeuvre. It flawlessly renders experimental past works as recurring motifs and finds a way to develop them in tandem with other hidden threads. 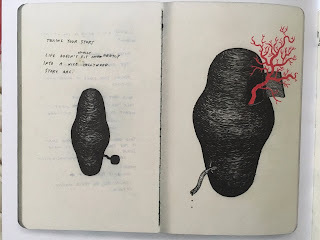 Nilsen leaves us not simply waiting for what’s to come, but stretches us backwards, inwards, to find what we may have missed in previous iterations of writer and reader.